I have never served in combat. I will never “know” how it sounds, smells, looks, feels and tastes. I will never know how the experience changes you – forever. But, I am lucky to know Rod Deaton through his blog Paving the Road Back: Serving Those Who Served in Combat. Deaton is a psychiatrist who serves at the Richard L. Roudebush Veterans Administration Medical Center in Indianapolis, Indiana. It’s the only math worth remembering: troop arrives, troop + War returns. When one lives with that reality, all-hands-on-deck even when at-ease, months at a time, hour after hour, one acquires an internal companion that invites itself in, settles itself down, and gives new meaning to the phrase adverse possession: the War. 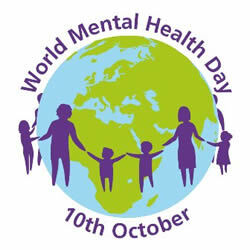 So, on World Mental Health Day, I thank psychiatrist Rod Deaton for helping me better understand the mental health challenges faced daily by veterans of all wars. And, I also want to thank Mrs. Rosalynn Carter. It is her Mental Health Journalism Fellowship that opened my eyes and allows me to keep growing in my understanding of mental health. Bobbie, Many, many thanks for such kind words. It remains a joy to “serve” with you, even though we have only “met” through our words. Sadly, we both have many years of work ahead of us–but gladly, we’ll both be there doing it, eh? For as I often say to the men and women I have the honor to serve: there ain’t no Plan B. As always, be well.